Kentucky's toppling of LSU in triple-overtimes should allow the Buckeyes to move up one more spot in the national rankings. The UK-LSU game was a great one! UPDATE: And thank you, Oregon State! for linking to the first two installments of my Hello, Goodbye series. at Laity Lodge, west of San Antonio. But it isn't long before he starts talking about the view at the local Starbucks and the Butter Burger at Culver's. Culver's, of course, is a chain out of Wisconsin. Although they have one outlet here in the Cincinnati area, the only one at which I've eaten is in Columbus. The Butter Burger, though certainly not recommended for the cholesterol-challenged, as Mark implies, is a tasty treat. I also like Culver's soups. The way to theologians' hearts is most definitely their bellies. about comfort food. What's your favorite comfort food? Meatloaf is another great comfort food, although I'm amazed by the fact that far fewer cooks seem able to make meatloaf than think they can. Even restaurants can't seem to get this right. Recently, one of my favorite chains featuring comfort foods, Bob Evans, messed up their meat loaf by adding sausage. Yuck! Then there's the even simpler comfort fare of tomato soup with ham sandwiches. My family used to eat this comfort meal when I was a kid. On Sunday nights, after we'd returned from a family jaunt to my paternal grandparents' restaurant and home in Bellefontaine, it was the perfect comfort capper to the weekend. We'd run by a place in Columbus called Isaly's, known for its dairy products, especially its ice creams. But they also had a deli. My folks would buy two pounds of chipped ham and a gallon of Isaly's chocolate milk. We went home, heated up some tomato soup, make our sandwiches, and....AHHHH! Pure comfort! Another comfort food we love in the autumn and winter is what in Columbus we called, Johnny Marzetti, named for the restaurant and salad-dressing maker there. In northwest Ohio, where we lived for six years, they called it Goulash, although it was made slightly differently. Noodles, tomatoes, ground beef, green peppers, onions, celery, and garlic. It is to die for! I mentioned my Grandmother Daniels earlier. She was a fantastic "comfort" cook, the reason that people came to what was referred to as my grandfather's restaurants. Whenever we went for a visit, she fixed beef and noodles for my father--it was great--and pumpkin pie for me. Ah, gastronomic memories! With such a love of food, how do I keep my svelte figure? Will Al Gore Run for President? Ann Althouse and lots of others have been asking that question since it was announced that the former Vice President is co-recipient of this year's Nobel Peace Prize. I doubt it. Walt Disney was once approached about running for mayor of Los Angeles. Disney responded to the group, which included science fiction author Ray Bradbury, "Why would I want to be mayor of Los Angeles when I'm already king of the world?" Al Gore would rather be right, at least right as he sees it, than be President. At times, he seemed to see the 2000 campaign not as a quest for the presidency, but for a statement from voters that he really was right. Right in claiming to be the smartest guy around. Right on the issues. Right morally. That's part of what lay behind all those impatient sighs and grunts during his debates with Dubya. There are some political figures who are better off not being President. They don't have the requisite "bend" or the love of the political game needed to be successful, even in the pursuit of laudable ends. 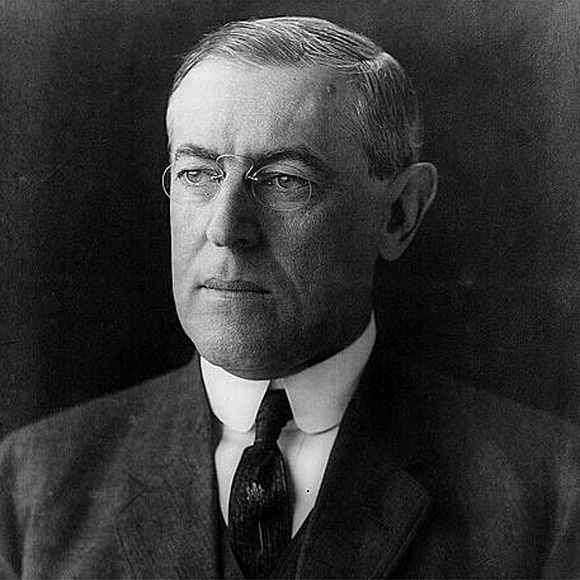 Woodrow Wilson, for example, was far too unyielding to achieve his goals as President. This isn't to say that his goals were wrong. It's just that the pedantic President gets nowhere fast. Outside the daily demands of politics though, almost-Presidents and would-be-Presidents can use their prominence to push causes. They gain hearings from the public and because they aren't susceptible to being voted down by Congress, rebuffed at the polls, or blunted by interest groups, they can undertake long-term campaigns for their causes and have some chance of success. And they don't have to dirty their hands being politicians. That's been Jimmy Carter's experience and I think Gore, in a way, is replicating it. Why would Al Gore want to be President, when he's already the king of global warming rectitude? The worst thing that my Ohio State Buckeyes could do is look past this afternoon's game against Kent State's Golden Flashes. That would prove fatal to the dim but brightening chances the team now has of actually competing in the BCS National Championship game. But it could be easy to look past Kent. After facing the Flashes, 3-3 overall and 1-2 in the Mid-American Conference, the Buckeyes have a challenging remaining Big Ten schedule to address, with a home date against improving Michigan State, a road game against the dangerous Penn State, two home dates (Wisconsin and Illinois, currently rankes 19 and 18, nationally), and then the annual trip to play the school up north in Ann Arbor. The Buckeyes have been winning their games by an average of 26.5 points, while the Golden Flashes are 0-8 all-time against the Big Ten. The Buckeyes should win. But after a second consecutive week of David and Goliath upsets in college football--which helped Ohio State move to fourth in the national rankings, Coach Jim Tressel will no doubt have alerted his players as to how dangerous this game is. To turn that should win into an actual W, every Buckeye will have to show up tomorrow. In the middle of a season holding so much promise, going through the motions just won't do. UPDATE: Obviously, Coach Tressel wasn't about to let his team look ahead to next week. The last five games of Ohio State's regular season will be an absolute bevy of landmines, as shown above. All of which raises an interesting question. Sometime last week, I heard Lou Holtz predict that there would be no undefeated teams among the BCS-eligible schools this season. Given the parity that exists these days, as evidenced by the bunch of upsets we've already seen this season, he may be right. But what happens if a team loses later in the season? Conventional wisdom has said that losing later, when teams have fewer chances to redeem themselves with wins and watch other teams that are ranked higher than them lose, was more deadly than losing earlier. This year, that seems all the more the case. In spite of the derision it cost them to lose first to Appalachian State and then to Oregon, at home for their first two games, those two losses may hurt Michigan less at the end of the season than two stumbles by say, LSU, in the next few weeks. Even though LSU will be playing tough SEC opponents and Michigan's losses are to a lower-divisioned team and a Pac 10 also-ran, respectively. The timing of losses is important in the two major polls. Now more than ever, we need a playoff system in big-time collegiate football! Do you know what my son James dreamed about last night?" a friend asked me. Her son was a bright child of about ten. "He dreamed about YOU," she went on. "James told me this morning that he dreamed he was being chased by King Kong. Then he met you. I wondered if you rescued him from the beast and James said no. He told me that you hid with him in the bushes while the Boy Scouts beat back King Kong with sticks.'" You have to appreciate the Boy Scouts! ingredient that, when present in a life, will ultimately bring peace. Babe Didrikson Zaharias, the great athlete, died of cancer. Her husband stood at her bedside weeping shortly before she passed on. Babe said to him, "Now, Honey, don't take on so. While I've been in the hospital, I have learned one thing. A moment of happiness is a lifetime, and I have had a lot of happiness. I have had a lot of it." Babe chose courage. But what she actually found was peace. You may be stronger than you think! Your real-life monsters can keep you awake at night, or you can allow them to awaken strength and power within you. It's a matter of choosing courage -- and finding peace. Steve sends out periodic emails with great essays like these several times every week. If you'd like to receive them periodically, just send an email from the email account to which you want it sent to: LifeSupport-subscribe@yahoogroups.com. Steve's web site is here. As I've prepared to take on my new call at Saint Matthew Lutheran Church and done some packing, I've presented something of a photo history of Friendship on our church's news blog. Here are links to the entire series, for those who might be interested. "For better and worse," an Evangelical Lutheran Church in America staffer told a crowd of newly-called pastor-developers and their spouses, including my wife, Ann, and me, "your congregations will reflect your personalities, your strengths, and your weaknesses." We sat in a large hospital-affiliated meeting facility in Omaha in July, 1990. We were part of a group recruited by our denomination's Division for Outreach to start new congregations across the country. In August, my family and I would move from our rural parish in northwestern Ohio and head for the Cincinnati suburbs where we would develop a new church. Spouses were invited to this gathering so that they would better understand the peculiar pressures, demands, and joys associated with starting new churches from scratch. When I think about what I'll miss as we leave the congregation we started, Friendship Lutheran Church, Amelia, Ohio and prepare to begin life at Saint Matthew Lutheran Church in Logan, Ohio, apart from the people here, the thing that comes to mind is that denominational staffer's words. To a remarkable extent, Friendship does reflect me and my personality. One part of me, the one infected with the common human ailment of sin and arrogance, will miss that most about Friendship. Christ doesn't call us to lives of comfortable repose. In The Cost of Discipleship, Lutheran theologian and martyr to Nazism Dietrich Bonhoeffer put things bluntly, "When Christ calls a man, He bids him come and die." In some cases, following Christ may entail, as it did for Bonhoeffer, actual physical death. But for all Christians, pastors included, it must entail a willingness to sacrifice one's arrogance, the hubris of our pretended self-sufficiency. In my case, there has been a subtle arrogance associated with seeing the development of a church which, "for better and worse..." reflects my personality, my strengths, and my weaknesses. Putting such arrogance to death isn't to be compared the martyrdom of a Bonhoeffer, the sacrifices of a Mother Teresa, or the risks taken by a Martin Luther, of course. It's easy for others to excuse the subtle pride I take in the development of Friendship. The congregation's continued existence seems to vindicate my vision, my style, my personality. I sometimes see the fact that Friendship is still around although some in my denomination thought a Lutheran congregation couldn't get off the ground in our community and others dismissed our thematic worship, blending the old with the new in a less formal (but still liturgical) style, as a personal triumph. And if I'm not careful, I sometimes start to believe it when people tell me, "Look at what you've done." As time passes, I may not recognize those statements for what they are: well-meaning, ego-appealing fibs. In allowing myself to believe such lies, however briefly, I overlook what Jesus tells us: "I will build My Church." Jesus may use sinners like me to build His Church, but He's the One Who does the building nonetheless. The development and continued existence of Friendship is not a testament to my cleverness, ability, or personal charisma, but to the enormity of God's grace. God was willing to use a sinner like me to build this amazing church in the Amelia area. I forget that at my own eternal peril. "Pride goes before destruction" is more than a familiar, gauzy phrase from the Old Testament. It's an observable truth. Those who arrogantly think that they're "all that" are inevitably cruising toward the destructive consequences of their self-worship, which may come at the end of our earthly lives, when God allows those who walk away from God to live eternally with the consequences of their choice. Or, if we're fortunate, we'll fail, crash, and burn in this life, brought up short by the reality of our sin and our need of God and driven to God's grace and mercy for the new life He gives to all who follow Christ. Self-worship is surely as much a violation of the First Commandment's proscription against having other gods as would happen if we bowed down to a carved image, a dollar bill, a tinhorn dictator, or a family member. Being hung up on ourselves as the object of our affections also clearly violates Jesus' "Great Commandment," in which He calls us to love God and love our neighbor as we love ourselves. There's no real room for God or others in the kingdom of me. The comfort that I feel as pastor of Friendship is a wonderful thing. In their acceptance of me, in spite of my imperfections, the people of Friendship exhibit the grace and the goodness of God. But I've increasingly felt that the comfort I feel here could represent a long-term threat to my effectiveness as a pastor, my Christian witness, my life with God, and my spiritual vitality. I'm convinced that Friendship's way of being church is valid and pleasing to God. I also believe that I now need to pastor in a congregation that doesn't so directly reflect my personality. I'm excited about going to serve a church that was founded in 1852, that is strong in traditions, while being committed to adding new traditions designed to share the Good News of Jesus with others. Ann and I feel genuinely called by God to go to Saint Matthew. But before I could be open to that call, I first had to sense God calling me away from the comfort of Friendship. It was apparently okay for me to experience that comfort for what turned out to be a long season of my life. But no longer. Now is the time for me to experience a different kind of comfort, the comfort of being part of a ministry which I can't delude myself into believing is of my making. As I go to Saint Matthew, I'm sure that Jesus will once more teach me that He will build His Church. In July, in a sermon, I recounted something that writer William Hulme witnessed: A mother bird seemingly chastising and cheerleading her baby to fly away from its comfortable "perch" on the ground. I talked about how Hulme says that human parents must do the same thing with their kids. In recent months, I feel that that's exactly what God the Father has been doing with me. If I'd stayed much longer, Friendship might have become, for me, the kingdom of me. Neither God or, in my most lucid moments, I want that. I will miss the comfortable-ness of being pastor of Friendship. I will miss the wonderful people of whose lives I've been privileged to be a part for much of the past seventeen years. But for God, for me, and for the people of Friendship, God has begun to show me, I dared not stay another moment. 1. While not everyone has agreed with my assessment, I believe that we've been able to do all of this through the years and still maintain our awe of God. A few years ago, a Roman Catholic priest of my acquaintance walked into our plain, multipurpose sanctuary and spent what seemed like five minutes taking it all in silently. I wondered what he was thinking. "What an inviting space!" he finally declared. "I can really feel the presence of God here." A deeply devoted Lutheran layperson has told me that when she worships at Friendship, "I can see Jesus!" 2. Humorist Garrison Keillor says, "When you're Lutheran and from the Midwest, it's always Lent." There's just enough truth in that observation to make a Lutheran laugh...and wince. While we reject the theology of wallowing, the notion that Christ died to make us miserable, we do embrace the theology of the Cross, believing that as we daily follow Christ, we must submit to the crucifixion of our sinful selves so that we can rise to newness of life. On a recent trip to the Grand Canyon, a troubled woman realized that there was something out there larger than her worries. She decided to toss her worries over the side of the canyon. It's a big world out there - much larger than our worries. When we step out into the world, we can leave our worries behind, or at least see them in their true perspective. Lord, help me trust rather than worry. SUBSCRIBE on the subject line. Glen is the pastor of Faith Lutheran Church in Springfield, Illinois. My family came to southwest Ohio to start a new congregation, what became Friendship Lutheran Church, on August 22, 1990. Thousands of door-to-door calls, some 740 Sunday sermons, and 52 Baptisms later, people ask me how I feel. How does it feel to be leaving? They also ask why. Why have my wife Ann and I decided to pick up stakes to go to a very different church in a small town? And closely related to this question is another one: Was this a sudden decision? My blogging colleague Mark Roberts, a Presbyterian pastor, recently left the congregation he served for sixteen years and has been eloquently blogging on his transtion to his new job at Laity Lodge in Texas. You can see some of Mark's reflections here. I told Ann the other day that I didn't think I'd be doing anything like that on my blog. Yet, over the past few days, I've felt compelled to answer questions like the ones above. And I find myself reflecting on the past seventeen years. Today, I'll deal with the questions of why and whether this is a sudden decision. Our decision to pull up stakes and move to Logan, Ohio, where I will become pastor of Saint Matthew Lutheran Church on November 1, wasn't sudden. Ann and I began discussing the possibility of my making myself available for "call" to another congregation in late-2005. I completed what my denomination refers to as "mobility papers"--I'm not making that term up, that's really what they call the eighteen page document all pastors considering a move fill out--in June, 2006. We felt no sense of urgency about leaving Friendship. What gave rise to our initial discussions had nothing to do with disenchantment with Friendship at all. We loved and love Friendship. Even as we contemplated the possibility of leaving, I still had enthusiasm for the congregation and its ministry. I still had a sense for the direction in which I thought it should go. So, why leave? In a nutshell, Ann and I came to believe that for Friendship to go to the next level as a congregation, it would require new pastoral leadership. Friends tell me that it's inapt, but I compare myself to the sofa you bought years ago. You loved the thing. When you brought it home, the room, as the interior decorators say, "popped." Besides all that, it was functional. It provided good service for years. But when you painted the living room walls a different color and changed your decorative motif, you moved the beloved sofa to the family room. Later still, it went to the basement for the kids to use when they played video games. You still valued the sofa and it had even, remarkably, maintained its color and firmness. It was still a great sofa. But it no longer made the room "pop" for you. I'm that old sofa. When the church moved from a school gym after twelve-and-a-half years and into the building with which God blessed us, I moved with it. I was a comforting presence. But sometimes, a new room needs a new sofa. And by new room, I'm not referring to our new building per se, but simply to the changed and changing circumstances that come to any church, family, business, or community over time. I was approached about interviewing with the "call committee" of one congregation in December, 2006. But Ann and I both were familiar with the church and were certain that it wouldn't have been a good fit for me or for us. We wouldn't go just anywhere. I turned the interview down. That first interview at Saint Matthew happened on July 10. The committee members were personable, obviously committed to their church, proud of its traditions, and anxious to try new things to reach out to their community. To my surprise, I found myself being pulled with increasing urgency in Saint Matthew's direction. We had loved small town, rural life in northwestern Ohio, which we'd enjoyed in my first call from 1984 to 1990, and though southeastern Ohio is a different place, the "feel" of Saint Matthew and of Logan appealed to me. Increasingly, I felt that this was the place I was supposed to be. But I didn't want to make a decision based on a wave of personal enthusiasm. Ann hadn't yet met the folks from the Saint Matthew call committee. I prayed, "Lord, I don't even know if the call committee and congregation at Logan want me to be their pastor yet. But you know I'm feeling tugged in that direction. I'll know what You want when Ann tells me that she wants to make this move." On August 11, Ann and I traveled to Logan for a follow-up discussion with the call committee at Saint Matthew. There were, we thought, insumrountable issues which would prevent the call committee from being able to recommend that the congregation call me to become Saint Matthew's pastor. On the way over though, Ann said, "If the congregation does call you, Mark, we should definitely go." Based on my earlier prayers, that seemed like a green light from God. I was interested in seeing what happened in our meeting. When we arrived for what we thought would be a one-hour get-together and ended up spending three-and-a-half hours with the committee, I could see that Ann, as had happened with me already, was falling in love with these people. Just like Ann, they were real, no phoniness about them at all. By the end of our meeting, we clearly sensed that this committee wanted us to be at Saint Matthew. In spite of the pain of saying goodbye to Friendship and to the community we've called home since 1990, we wanted to be at Saint Matthew. And, through Ann's words on our drive to Logan, God appeared to want us to be at Saint Matthew, too. Because we kept our lips zipped publicly until September 2 and before that, had only told a few friends and Friendship's lay leadership about the strong possibility that we would be leaving for Saint Matthew, it may have seemed like a sudden, impulsive decision to some. But God had been preparing us for this move for at least two years. We had prayerfully considered this specific call for three months by the time we went public with it. But how does it feel to be leaving here after seventeen years? I hope to address that tomorrow. Anne Marie Howard is the actress who, several years ago, was brought in by GMAC to legitimate the Ditech brand it had acquired after years of the "Lost another one to Ditech" campaign. She immediately classed up the lender's bad image. But as smooth and compelling as Howard is on camera, not even she will be able to turn Dennis Kucinich into a top-tier candidate for the 2008 Democratic presidential nomination. That's what Howard is valiantly trying to do in "anchoring" what the Kucinich campaign says will be weekly video updates. But irrespective of politics, does anybody think that the almost hagiographic presentations of candidates produced by all campaigns actually persuade anybody? That's the title of Charlie Lehardy's typically thoughtful discussion of forgiveness and grace, triggered by last week's revelation of a track star's use of steroids. Marion Jones has fallen from a very great height. Her admission of drug use will erase or call into question every title, every medal, every accomplishment she has worked so hard to achieve. Forgiving her doesn't mean condoning her cheating. It means that each of us can look in the mirror and see what she sees — a person who has cheated, compromised, broken the rules and failed in the eyes of God to live a perfect life. By the grace of God, most of us haven't fallen in the spectacularly public way that Marion Jones has. But let's not kid ourselves — when we imagine standing before God and answering for our lives, we can easily identify with her sense of shame. Marion Jones must be experiencing a kind of agony right now. But her agony can't compare, I think, to that of those who refuse to forgive as God has forgiven them. They live in a prison of their own choosing. Read Charlie's entire post. Several years ago, one of the first blogs I began reading with any regularity was Tabletalk by Craig Lewis. In a series of new posts responding to a letter from a skeptical friend, you'll see why I have such a high regard for Craig. In Questions from Without, he discusses issues raised by his friend, explaining what he believes. Not once is Craig arrogant, dismissive, or condescending. He's Christian. In his first-century letter to the church in Asia Minor, a reforming religioholic Peter writes, "Always be ready to make your defence to anyone who demands from you an account of the hope that is in you; yet do it with gentleness and reverence" (First Peter 3:15-16). What that tells me as a Christian is that I should be ready to tell people why I personally hope in Christ. Not what somebody else told me to memorize. It also tells me that my attitude in doing so shouldn't be what I call religious imperialism. Christians know that we can take zero credit for the hope that we have. That's a gift from God. Nor do we need to defend God; God can take care of Himself. We're simply to tell others why we hope in Christ. We leave the rest up to God's Spirit. Read Craig's gentle, informative posts. Questions from Without: Is God Omnipotent? Questions from Without: Whose World Is It? Questions from Without: Is God Good? Questions from Without: Why Do Christians Evangelize? Questions from Without: When Christians "Evangelize"
Questions from Without: Am I a Christian? Questions from Without: Where Did God Come From? Two weeks ago, we began this series on Overcoming Worry by saying that worry is like the static we hear on low-tech radios like the ones in my car. When I drive further away from transmitting radio stations, static takes over and I can’t hear them any more. Worry can do something similar, blocking out the assurance, love, and power for living that God wants to give all people through Jesus Christ. The number one foundational method for overcoming worry is to place our whole lives in the hands of the God we know through Jesus Christ. But how do we do that? It isn’t easy. Many times in my life I’ve told God, “Lord, I place this problem in Your hands. Your will be done.” But too often, usually within seconds, I find myself worrying about the very thing I just handed to God! How can we let God take our worries from our shoulders and instead of taking them back, emerge with a positive plan of action for our lives? Our Bible lesson, taken from Psalm 104, gives us a good program, I think. You should know though, that to take these steps for eradicating worry from your life, you’ll have to invest the most precious commodity you possess. Time. To overcome worry, we have to spend time with God. To see an end to our worrying, we need to train ourselves in godliness by spending time with God. Psalm 104 gives us one plan for doing that. Obviously, that man was wrong. Irrespective of the mechanism the creator uses to create, anything created requires a creator. And that includes this amazing uinverse! Banishing worry from our lives can begin for us when we contemplate, as the psalmist did, that we belong to the same great God Who created the universe in which we live. The crucified and risen Jesus Christ, God reaching down to us in humility and love to make it possible for us to live with God forever, assures us of that! We belong to God. In our quiet times with God, the second thing we need to do is remember that God is still active in this world and still stoops to hear our prayers. Millions of people have found this truth to be a great banisher of worry. Sir William Osler, father of modern medical science, once said that one way he overcame worry in his life was to pray, “Give us this day our daily bread.” In saying that prayer, taught by Jesus, Osler expressed faith that God would provide his needs that day, freeing him to focus on the tasks of the day, rather than stewing about them. None of this means that God is a genie who will give us all we want. But it does mean that God is our compassionate maker, prepared to give us what we need and prepared to use those who are tuned into Him to be the conduits for His blessings to reach others. Someone may ask, "If that's true, then what about the starving people of the world?" The starving and others who suffer want of other sorts in our world neither disprove God's existence or His compassion. The existence of starving millions only prove that the haves aren't concerned enough to find ways to share what God has given to them with the have-nots. God is still active and still hears our prayers. He's still in the business of providing daily bread. To banish worry from our lives, we need to remember that. In verse 33, the psalmist says, “I will sing to the Lord as long as I live; I will sing praise to my God while I have being.” This is the third thing the psalm reminds us to remember in our battle to overcome worry. A national magazine once ran a profile of a young African-American growing up in inner-city Baltimore. Throughout his growing-up years, he swam against the stream. While he studied hard and got good grades, his classmates derided him for wasting his time and pressured him to join the gang, do dope, and enjoy some good times before dying young. But that young man was fortunate: He had a mother who worked two jobs, loved him and disciplined him, and pushed him to do well in school. But she gave him something even more important than that. She prayed with him, read Scriptures with him, discussed the goodness of God with him, took him to worship and to Sunday School, and expected him to attend the Wednesday night services even when she was working. She wanted her son to know that if he remained connected to the God we meet in Jesus Christ, his life didn’t have to be the hopeless cesspool his friends thought it was. Time and again, that young man was tempted to chuck all the hard work, including the work involved in resisting temptation and remaining pure for God. I'll never forget the climactic vignette in that article. The writer wondered, with everything seeming to work against him and the temptation to give up constantly dogging him, how did he maintain his focus? How did he remain tenacious in the pursuit of his dreams? How did he hold onto hope? On a Wednesday night, the writer followed him to the Wednesday night prayer and worship service. He saw the young man stand with other members of the Church as they sang and prayed their praises to God and with hearty Amen's shouted their affirmations of the Pastor's message of hope from Christ! In his times of temptation, that the young man took his gaze off of himself and his own circumstances. He turned instead, to look on God and to praise Him. When he lifted his praises to God, God lifted him up. Here’s what I’ve learned in my own life. (Actually, it's what I'm learning in my life because I often wonder whether I'll have truly, definitively learned it before I die.) When my focus is on elevating myself, life pulls me down. I worry. I stew. I get nowhere fast. But when I shift my focus onto God, God lifts me up. He gives me the power to live and hope and thrive. To overcome worry, we need to take the time to praise God every single day. The third step the psalm gives to us for overcoming worry is to spend time praising God! Finally, the psalmist writes, “May my meditation be pleasing to him, for I rejoice in the Lord.” Meditation isn't just for the adherents of religious systems. The Bible says that believers in the God we know through Jesus Christ are supposed to be into meditation. Pastor Robert Schuller says that a great way to picture Christian meditation is to imagine yourself riding in the backseat of an open convertible on a clear sunny day. When Christians meditate, they turn their lives toward heaven. They let Jesus the Son shine on them. They let the Holy Spirit blow the breath of God into them. In the first three steps I’ve discussed this morning, we tune into God. In the fourth step, meditation, we clear away the static and listen to God’s instructions. We do that first, by reading a bit of Scripture and then by listening, not for an audible voice, but for that still small of voice of God telling us that in spite of all our worries, God is still there and still will give us strength. We let God show us how to apply His Word to our daily challenges and opportunities. Years ago, as I was preparing a message on this very topic of worry, I was praying and decided to take a few moments to be still before God. I did something very hard for me: I shut up! I sensed God almost laughing at me. Here I was telling people to stop worrying and yet I spent hours each day worrying. I realized again that while my worries were too big for me, nothing is to hard or too big for God to handle. I felt as though God was inviting me again to hand my worries over to Him and get on with my life. As profound as that experience was though, if I don’t spend time with God each day, I start to forget how good God is and can only seem to remember how big my problems are. It’s so easy to fall back into the bad habit of worrying instead of living. Don’t let that happen to you! Remember that a powerful God made you and that through Jesus Christ, you belong to Him. Remember that God is still active in your world and will stoop to answer your prayers. Remember to praise God, focusing attention on Him and in the process, lifting yourself up too. Next week: Four affirmations and four action steps for overcoming worry, all taken from another psalm, Psalm 145.